C0042 Cover. FFC. 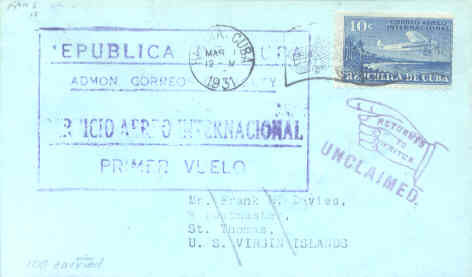 St Thomas-Nuevitas, Dec 5, 1931. Edifil No C63. 70 Euros. 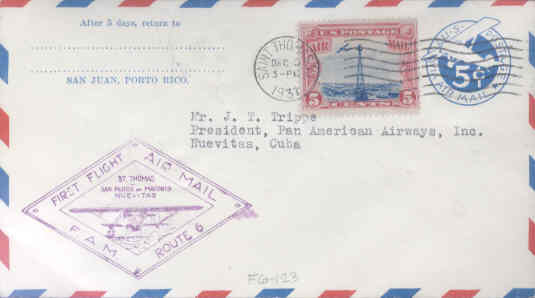 F1001 Philately, FFC: Santiago de Chile-Habana. Jul 17, 1971. No Cachet. (not listed) . 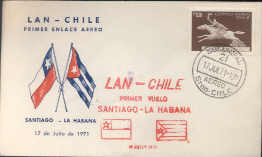 F1003 Philately, FFC: Edifil C79 Santiago de Chile-Habana. Jul 17, 1971. Black Cachet. 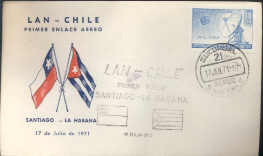 F1004 Philately, FFC: Edifil C79 Santiago de Chile-Habana. Jul 17, 1971. 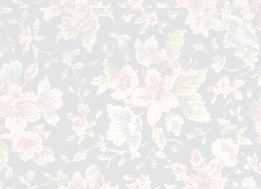 Violet Cachet (not listed). 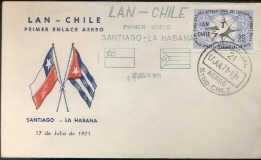 F1005 Philately, FFC: Habana-Santiago de Chile, Jun 26, 1971. Cubana. Cachet . 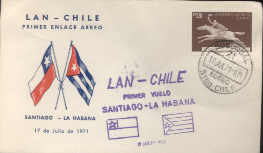 F1006 Philately, FFC:Edifil C79 Santiago de Chile-Habana. Jul 17, 1971. Blue Cachet (Not listed). F1008 Philately, FFC: Edifil E157, Habana-Santiago de Chile. Cubana de Aviacion, Jun 26, 1971. Violet Cachet. 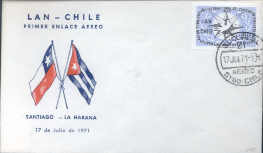 F1009 Philately, FFC: Edifil E157, Habana-Santiago de Chile. Lan Chile Jul 18, 1971. (not listed). PP046 Scott No C169-71 United Nation Day, 1957. 3 Proofs. Some small flaws. X0107d Scott No C235-37, 1p,2p & 5p Air Mail (Birds 1962).Block of 4 Imperforates. Interesting and scarce item.